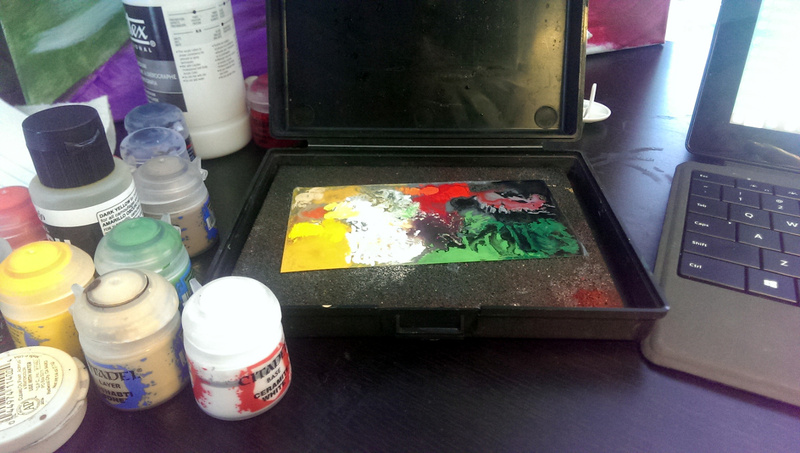 A tool you will hear from many different painters in our hobby is the mighty wet palette. As much as it sounds like the start of some juvenile joke, a wet palette is simple a container holding a sponge with a paper material sitting on top. The sponge is kept full of water which keeps the paper moist, and in turn keeps the paint sitting on the paper moist. The theory is that you can use the paper as your pallet and it will stay usable as long as the sponge stays wet. Using a wet palette isn’t too different than using a normal palette in the sense you take your paint out of the pot/tube and place it on the palette. The difference is first wetting the sponge with a nice bath of water, enough to make the sponge soggy but not so much that you have free standing water in your container. The paper material is then placed on top and allowed to soak. It is often advisable to flip the paper over as it starts to soak which helps prevent it from rolling up. Once paper is nice and wet, take a tissue and wipe off any standing water on its surface. You can then start adding your paints, but realize that you shouldn’t thin them down as much as you might on a typical palette, the water will soak though the paper a bit and water them down. As the paper starts to dry it will begin to curl away from the sponge, causing all sorts of problems. To remedy this make sure the sponge stays moist but adding additional water throughout your painting session. You can also force the paper back down to re-wet it and prevent it from curling. I’ve talked before about using acrylic painter retarder to keep your paint usable for longer, but a wet palette provides a different, but complementary solution. The wet palette keeps your paints usable on the palette from long periods of time, in fact if you seal the container it can leave the mix on the palette usable for weeks. This is great to save special paint mixes or blends that you are working with. The paint retarder keeps paints wet even off the palette. This is useful for wet blending on the model where you add a bit of one color to an area and a different tone to another while they are both still wet. You can use a brush to them mix them together on the model. Paint retarder allows for more time to accomplish this. By using both the retarder and the wet palette you get the best of both. The palette keeps the paint usable for long stretches and the retarder allows for mixing after it has left the palette. Ok, so I’ve sold you on the importance of using a wet palette, but how do you go about getting one? You have two options here, build your own or buy a ready made one. 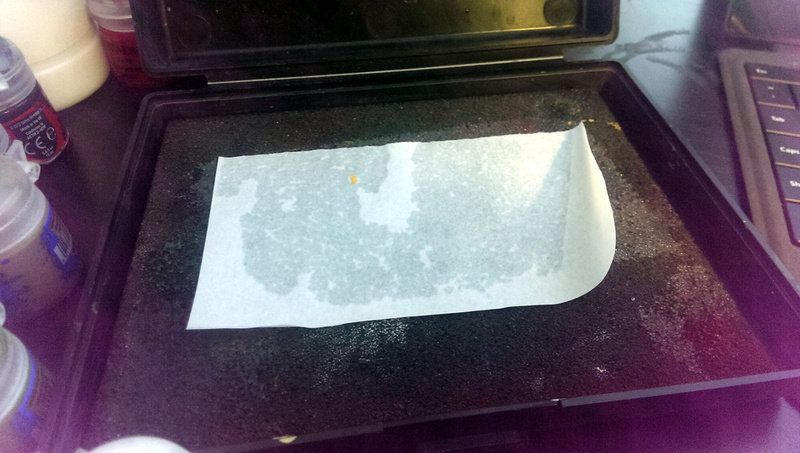 I started with one I built my self using a Tupperware container, an old blister pack sponge, and baking parchment. If you are looking for some inspiration, check out Thor’s wet palette tutorial, Tobi’s Minis article or Full Borer’s, all of which have great step-by-steps on building your own. I personally got tired of cutting the parchment up and having it never fit correctly on the sponge. I actually bought the Privateer Press P3 Wet Palette for only $17 buck on Amazon which included a pad of pre-cut paper. When I bought it, I actually bought a second pad of paper as well thinking that I would use it up quickly, but I haven’t finished half of my first pad after using it over two years now. I like the Privateer Press version because it is relatively small (6.5 x 5.5 x 1.5 inches) – much smaller than my Tupperware, and it snaps closed which keeps the paint wet for nearly a week.